Today was another cold, snow filled day. I am definitely suffering from SAD (seasonal adjustment disorder)! I think I can speak for most in the US; we are ready to kill the groundhog! I decided to work from home and found myself perched in a too low chair with a lap-bound computer trying to wrangle some too large spreadsheets on a too small screen. Dealing with the vagaries of a pivot chart, I got frustrated and absconded from my work to grab tea in the kitchen. Then I saw it. 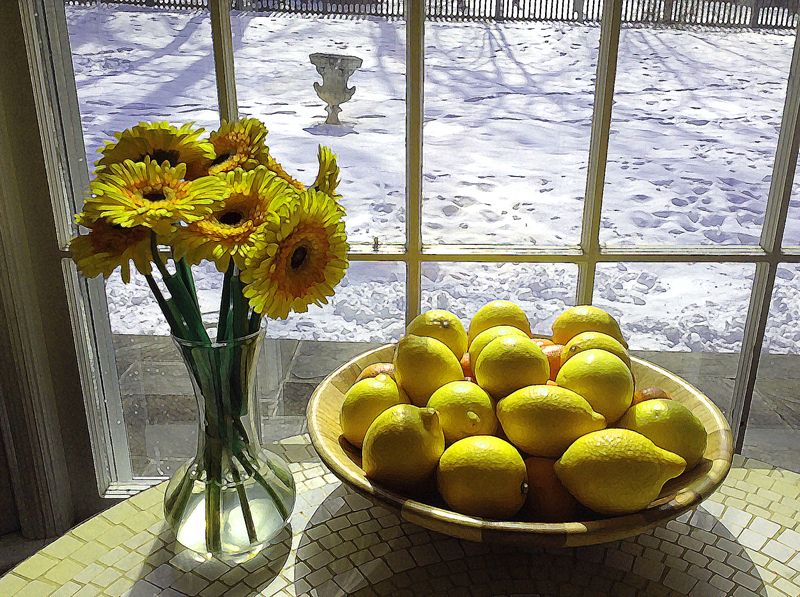 The stream of sun bouncing into my front window – the whole room awash in yellow and gold as the warm bright rays illuminated a wooden bowl of lemons and oranges. Next to it sat my still fresh birthday flowers. They turned their faces up to the welcome brightness and seemed to smile at me. The scene filled me with joy and my gloomy and perturbed mood passed quickly. Even now, Spring come quickly! Thanks for sharing. i understand about the ground hog. Funny how Africa is mostly too bright and hot. Sending you some warmth. YES PLEASE DO! We might climb above freezing today only to host another storm this evening. I try to see the bright side of it all though… Hard winter freezes tend to kill the nasty gnats in the summer. Yay! Have a blessed and bright day and thanks for stopping by!